PC/104 is a standard regulated from the PC/104 Consortium. 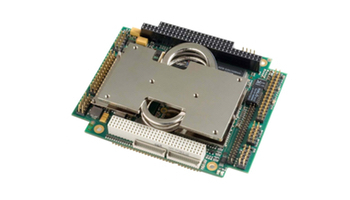 This organism defined 90mm x 96 mm modules, "self stacking", PC/104, PC/104-Plus, PCI-104 Express o PCI-104 I/O, with 104 pin's ISA bus and/or with 120 pin PCI bus, and/or 150 pin PCI Express. This mechanical format makes the boards espacially adapt to set up embedded applications avoiding the use of backplane. It is possible to protect the PC 104 boards inserting them in special box called Can-Tainer. PC/104 boards cover a wide set of computation power (from AMD Geode™ LX800 to Core™ 2 Duo L7400 ). This products have a high scalability level thanks to the use of smart Module™ technology and standard.